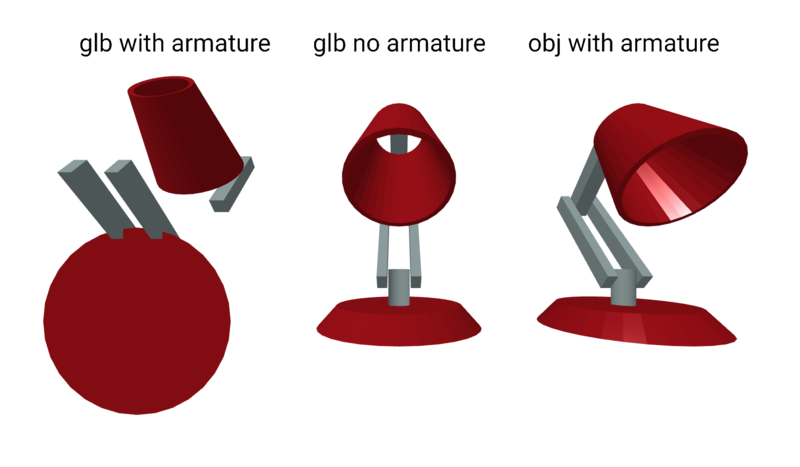 How to correctly export gltf/glb with armature applied? I am having a persistent issue when exporting glb and gltf models from blender (2.79) that have armature applied. I am using this exporter. Exporting the model with an armature NOT applied gives me the expected result (ie it appears as it does in Blender) but as soon as I apply an armature (before I have even added any animation) the model exports with all the shapes rotated. There is at least some consistency to the problem in that it appears as though all the shapes are rotated through 90 degrees on the X axis (although some are positive and some are negative). To compare I have exported a glb with no armature, a glb with armature, and an obj with armature just to check that there is no issue with my original file. (I have done the same with gltf just in case. You can see a screenshot of that comparison below brought into a-frame. Here is a side view for ease of comparison. You can see how the individual shapes are flipped 90 on the x axis. And here is a link to a zip of the blender file. I have looked at many similar issues that suggest applying all rotation/scale etc. tidying up the model etc. I have done all that and tidied up my model as much as I know how. It seems as though the model and armature is ok as the obj export works fine. I have seen similar questions such as this one but they are mostly to do with distortion of models once animated. I have worked backwards to understand the root of the problem and it does seem that simply applying the armature is what explodes the model in this way. Am I doing something wrong? Is there an export setting I am missing? Any help greatly appreciated as ever. And if any more info is needed, please let me know. Browse other questions tagged rigging armature export gltf or ask your own question. glTF: How to optimize exported glb file from blender having more number of loop-cuts? How do I access the glTF Metallic roughness shader node with Python?